The BAILY family owned Hall Place from 1820 to 1870. Detail about the background of the family and their time at Hall Place can be found in Lawrence Biddle’s book “Leigh in Kent 1550-1900” Chapter 15. Below is a family tree based on information from the book and subsequent findings. The information that follows is from genealogical searches on various websites undertaken by Joyce Field in 2014. Please contact the Society if you have further information to add on the family. 24 April 1787, Thomas Baily a bachelor, Elizabeth Smith a spinster of the parish: married by licence: in presence of John Gale and James Singleton. (n.b. could neither Gale nor Singleton marrying a “Smith” at Lambeth – so do not know connection). There are 10 children being baptized at St Mary Lambeth to a Thomas/Elizabeth Bailey between 1779 and 1799. Thomas/Elizabeth did not marry until 1787 (by licence, although no age was given on licence, nor the word ‘minor’ used to refer to Elizabeth), although two of their children are clearly noted as born 1785 (ie. out of wedlock). Thomas Baily was born 1746; Elizabeth Smith was born ca 1757 (according to her death entry, although 1761-66 according to 1841 census). So possible for children to have been born as early as 1779. There is also the baptism of another Elizabeth 16 Dec 1787 (after the birth of Elizabeth 3 Oct 1785 and before her baptism Feb 1788). This is causing confusion and leads one to believe that perhaps there were two couples Thomas/Elizabeth having children at that time. To date have not managed to discount any of the children as being of “our” Thomas and Elizabeth, nor (with the exception of four children: Thomas 1785, Elizabeth 1785, Jane 1788, Farmer 1799) can I prove the others are of Thomas and Elizabeth. If they had two children out of wedlock, why not the four earlier baptized children, Thomas, Sarah M, George, Elizabeth? And there are Mary Ann and Sarah baptized 1790, 1792: without these two baptisms, there would be a large gap between Jane 1788 and Farmer 1799. (The duplication of Christian names also makes one assume possible early death of a couple). With the records currently available to search on-line, I have looked at St Mary Lambeth, plus St Giles Camberwell, I can find no marriages of the other six children. Burials online are currently only 1788+ for St Mary Lambeth: searched 1788-1793 and could find no ‘correct’ Baily children; plus also searched the index and there were no children corresponding, having died young. Could also not find marriages for any of them at Lambeth or Camberwell. Of course, they could have married elsewhere; or been buried elsewhere, except that baby Farmer Baily was baptized 1799 at St Mary Lambeth, so would assume any burials would have taken place there too. Jane Baily of St Giles Camberwell and Alfred Thrale Perkins, church by licence with consent of Thomas Baily her natural and lawful father, 30 June 1807, in presence of: Thomas Baily, John Perkins, Henry Perkins, Charles Banley, Eliz Baily, Amelia Perkins. Parish Register of Lambeth St Mary gives the marriage: 24 April 1787, he a bachelor, she a spinster of the parish: married by licence: in presence of John Gale and James Singleton. (n.b. could find that neither married a “Smith” at Lambeth – so do not know connection). So William Baily had brothers John Walker (d.1873), Charles d. 1878 and also Henry Baily of 71 Gracechurch Street. (The two nephews are sons of John Walker Baily). Died Camberwell 1838 (source via sjmacintosh** on ancestry.com). We DO NOT have a copy of the WILL. It would be useful to clarify what children were still alive in 1838. Death of Thomas Baily given in Evening Standard 19 May 1838: Death 11 May of Thomas Baily of East Dulwich aged 92. Wills: of Hugh John Baily dated 23 Feb 1753 Dorset: Wills in the Peculiar of Gt Canford & Poole from 1650; Archdeaconry Court of Dorset of the late Diocese of Bristol 1660-1792. Search finds no Thomas/Farmer born at Canford, or elsewhere in Dorset at relevant time. 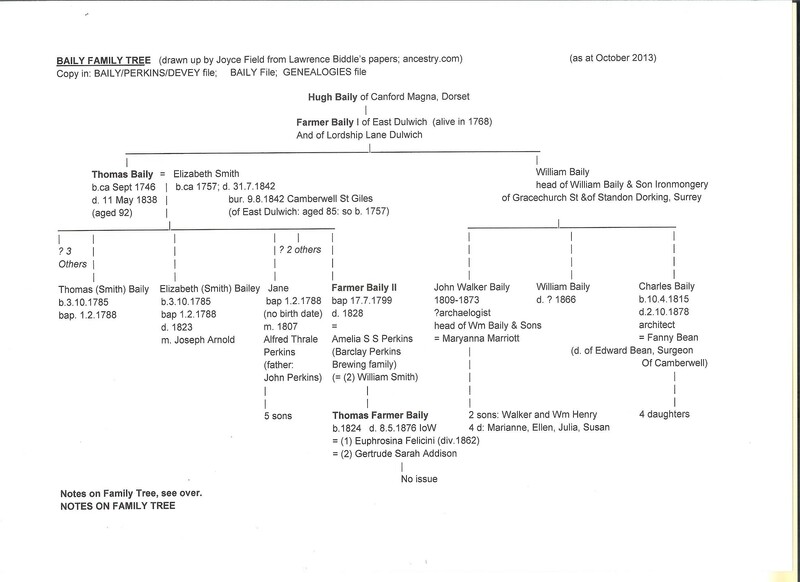 FamilySearch: cannot find any of the earlier Bailys being baptized Dorset or London, prior to Thomas Farmer Baily son of Farmer Baily/Amelia. Of course, this could just mean that the records are not available on these websites at the moment. 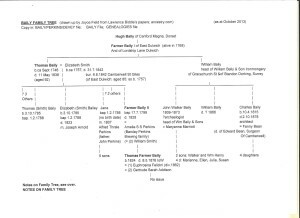 **(SJMacintosh found in member’s trees on Ancestry as researching Baily. Have not made contact ).